To bird is to listen. And once you know the vocalizations of the local birds, an unusual bird stands out. 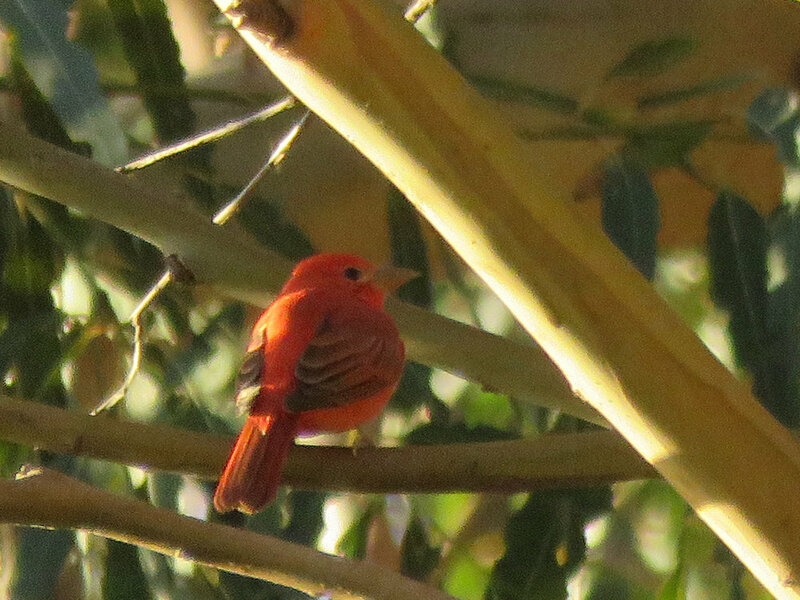 That’s how Erica Rutherford and I discovered a summer tanager last fall in the Claremont Canyon Regional Preserve. Within minutes of stepping out of our car on October 30, we heard “pit-ti-tuck,” a vocalization reminiscent of an expected (albeit out-of-season) species, the western tanager . . . but not quite. So, when we heard “pit-ti-tuck” again, we ran. There, perched in an oak tree at the Stonewall Road entrance to the preserve, was a male summer tanager (Piranga rubra) the only completely red bird in North America. We followed the tanager for 30 minutes, or so, as it flew across and higher into the eucalyptus canopy. In California, summer tanagers seldom come as far north as the Bay Area and normally fly south for the winter. This handsome bird, photographed by the author in December in its favorite oak tree, spent several months last fall/winter at the edge of the mixed-wood forest near the entrance to the Claremont Canyon Regional Preserve. When Erica and I bird, we count and then submit a list of every species we hear or see into eBird, a worldwide database of bird sightings. Once submitted, eBird will produce a rare bird alert for unusual sightings, such as ours. As a result of the alert, many other birders stopped by Claremont Canyon to see the summer tanager. We re-found the bird in December and hoped it might stick around for the December 16, 2018 Christmas Bird Count, when we would lead our group of counters in the Berkeley polygon, which runs from Claremont Avenue north (Dave Quady’s group (click here) counts from Claremont Avenue south). We did indeed find the bird during count week but not on count day, which was rainy and yielded low counts across the entire Oakland Circle. A long-distance migrant, summer tanagers breed across the southern and eastern United States and winter in southern Mexico, Central America, and northern South America. The species generally migrates at night and some populations traverse the Gulf of Mexico during migration season. The summer tanager eats a wide variety of flying and nonflying insects, as well as fruit, but is known to be a bee and wasp specialist. While it’s thrilling to see this gorgeous bird so close to home—and gratifying to think it chose Claremont Canyon as the place to spend the winter—this species, like many others that would normally winter much further south, continues to lose its winter home to habitat destruction. The summer tanager is considered a Bird Species of Special Concern. Coffee drinkers can help protect winter bird habitat by switching to bird friendly, shade-grown coffee. To consider supporting birds through your coffee purchases, visit the Golden Gate coffee club, https:// goldengateaudubon.org/coffeeclub or buy directly from certified bird friendly roasters such as Birds & Beans. Based on genetic studies, taxonomists removed the Piranga tanagers (scarlet, summer, western, and hepatic tanager) from the tanager family (Thraupidae) in 2009 and placed them in the cardinal family (Cardinalidae) with buntings, cardinals, and grosbeaks. Since 2009 Erica and I have observed 111 species of birds in Claremont Canyon. Anyone can view the data accumulated in eBird. For example, to view the birds in the Claremont Canyon Regional Pre- serve, visit the eBird “hotspot” for the park.